In 1968-69 Robin Knox-Johnston won the Sunday Times Golden Globe Race, the world’s first solo, nonstop circumnavigation. In June 2018, 30 sailors will set out to honor that historic accomplishment, marking its 50th anniversary by also attempting to sail 30,000 miles, alone, nonstop, unassisted, around the world. They must sail full-keel boats designed before 1988 and electronic navigation is not allowed. 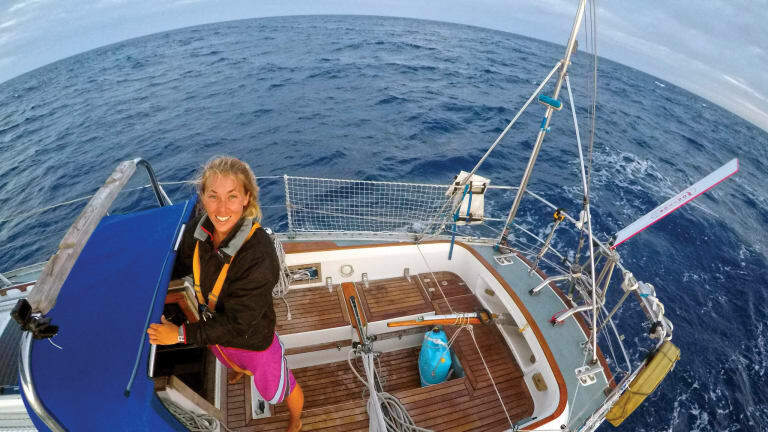 At 26, Susie Goodall was the first woman to enter this Golden Globe Race 2018 (goldengloberace.com). She is an accomplished professional sailor, having logged countless hours aboard boats of all sizes, and has sailed thousands of offshore miles. SAIL interviewed her in Antigua shortly after she’d completed her qualifying passage. What was your motivation to consider entering the Golden Globe? I had always wanted to sail off around the world by myself. I think it came from my brother. He was a very ambitious sailor when we were younger, and he was super competitive in dinghy racing. His big goal was the Vendée Globe, the French nonstop around-the-world race. I was this painfully shy child. I heard that people can sail around the world on their own, and I thought this would be really cool. I found out about the race, signed up and got in. Why do you want to sail solo? As a kid, I was always on my own. I never enjoyed crewing in races. I got myself a Laser when I was 11. On a Laser I’m on my own, I’m in charge of the boat. There’s no one to argue with. I think sailing solo has made me more social, but I am definitely introverted. Being social doesn’t come naturally to me. It takes effort. 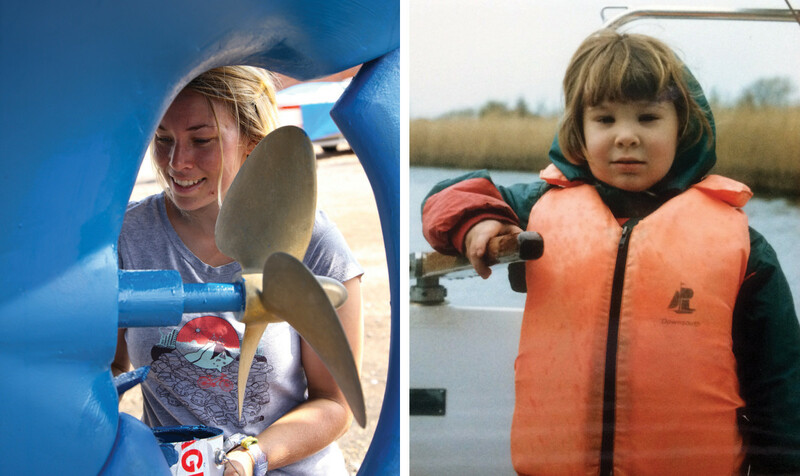 Did you grow up knowing you wanted to be a professional sailor? I didn’t really know that you could be a professional sailor when I was in school. In college, they were trying to push everyone to go to university. I was the only one that didn’t go. Then I heard about this water sports course, and I thought, perfect. I ended up becoming a sailing instructor for something like five years. Then I learned about the whole superyacht industry and the sailing instructor world. It just went from there. When you signed up for the Golden Globe, had you told anybody? No, I signed up and no one knew about it. I first told people about a week after I got in. And then I sent a text to my brothers, an email to my dad and then I called my mom. I sat there with my phone in my hand for about an hour, and I thought, how on earth do I phrase this? The first thing my mother says is, “What’s wrong? Are you okay?” Moms pick up on everything. But she’s amazing. She’s so supportive. I didn’t actually tell her everything to begin with. I said, “I’m doing this round-the-world yacht race, and I’ve got a spot on the start line.” I don’t think I said it was nonstop. And I left out the part that it’s without GPS. I left out the part that it’s a really small boat as well. And how long it would take. And then slowly, I drip-fed her the rest of the information. What was your first step when you got the news? I’d never put a campaign together. I’d never approached anyone for sponsorship. I hadn’t bought a yacht before. I’d never worked the yacht racing side. The only proper racing I’d done was Laser racing when I was younger. I basically just started talking to people, finding out how to do this sort of thing. First, I bought my website. Then I set up social media: Facebook, Instagram and Twitter. I then did a lot of research into how you approach sponsors. I’m a sailing instructor —that can’t fund the whole campaign. How did you choose your boat? I knew I wanted a Rustler 36. I just love the Rustler, it’s such a good boat. They’re solid, and they’re so seaworthy. I had to borrow a little bit to buy it, and then I was broke. Once I’d gotten the boat, I wasn’t even halfway there. It needs a big refit to be ready for the race. I couldn’t just quit my job, because that was my only source of funding. So, I’d get up at 0400 and send email after email to potential sponsors, and then go work on the boat. Was your 2,000-mile qualifying passage from the UK your first long-distance solo voyage? Yes, I was quite unprepared for the first passage. I had no spares for anything. I ended up breaking my steering and all sorts of stuff. I learned a lot on that passage. Did reality meet your expectations of what it would be like to sail solo? Reality was exactly what I had thought because I had gone over it so many times in my mind. I had this solid plan of how I was going to do my 2,000-mile loop. Plymouth, England to Muros, Spain was a lovely crossing. The English Channel was exhausting—so much shipping. And then the Portuguese coast was exhausting. I didn’t go a couple of hours without seeing a ship coming down the Portuguese coast. So, I was exhausted when I got to Lisbon. But it was a good learning experience, and it gave me a little bit of confidence in that, actually, I can stay awake for 48 hours if I have to. Once the race starts, you’re cut off from the rest of the world. How will communications be managed? We have HF (high frequency) radio and also a satphone. But the satphone is programmed to speak to race organizers and the medical team only, so you can’t call home. We’ll have a weekly check-in via HF, and the satphone with race organizers. We’ve got to keep a satphone on the whole time, but not the HF. What are the ages and backgrounds of the competitors? Everyone has a completely different background. Some are very experienced ocean racers and have done the Vendée Globe. Others are sailing instructors like myself. A complete mix. And the same with ages, there are three of us that are 27. The rest range from their thirties to their seventies. Have you thought about how to deal with fear while sailing solo? Definitely. There is a real fear of being dismasted, hitting things like shipping containers or an iceberg, those sorts of things. There are going to be times that are just scary. When it comes to the race, you hear all these horror stories of the Southern Ocean. Recently, one of my competitors was sailing from Australia to the UK. He was dismasted 300 miles west of the Horn, and had to abandon his boat. He was picked up by a passing tanker. When his mast broke, his life raft was on the coachroof and was damaged. I was planning on keeping my life raft on the coachroof. Now I’m a little hesitant about it. The race starts in June 2018. What’s on your checklist? There are quite a few things I want to change, like my companionway hatch. If I flipped over, then it’s just no good. I’m going to have that like a submarine hatch. Also on the refit list is a new mast, reinforced chain plates, replacing a lot of the deck fittings, new winches and adding more winches. And a solid cuddy: the deck’s leaking a little bit as well. What do you want to recommend to fellow sailors? If you want to do something, just go and do it. When I first signed up for the race, having no plan, everyone was like, “Well, you’re just going for it. Just do it.” It’s one of the best things that I’ve ever been told, even though we hear it all the time. If I think about how big the race is, it’s a bit daunting. So, I’ve broken the race up into sections. It’s the only way I will get through it. Get past the Canaries, and that’s a celebration. It’s a huge thing but just broken up into tiny little chunks for me. How do you race around the world? One mile at a time.